I was printing out a map for a new trail we wanted to hike. I wanted to fill the paper with the map -- Google maps' print and Firefox's print, while fine for most map printing, weren't what I wanted. 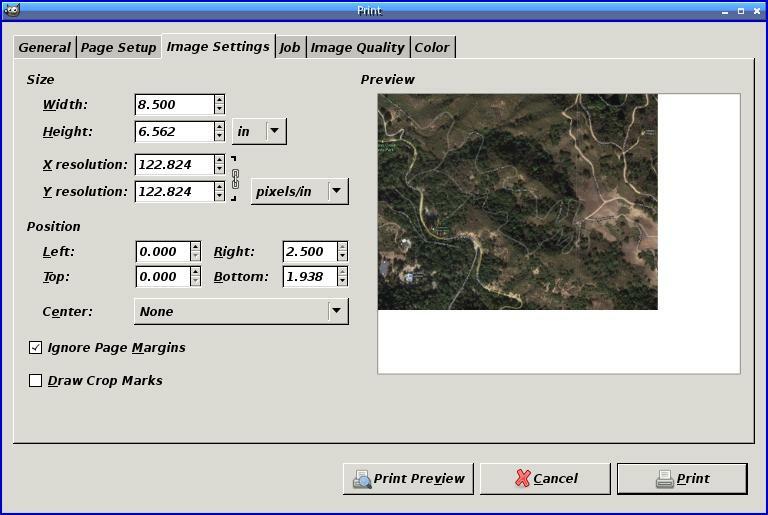 So I took a screenshot of the maximized browser window with the map in it and imported it into GIMP. 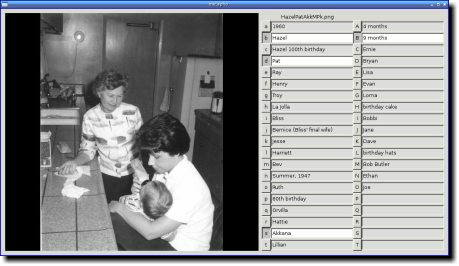 In the Crop tool, I constrained Aspect-ratio to 11:8.5 and cropped the image so it would just fit on a page, in landscape format -- wider in east-west than in north-south. Then I chose File->Print. Unfortunately, When I went to the Image Settings tab to check , I discovered that GIMP hadn't adjusted the image size when I changed to Landscape. It had Width listed as 8.500, Height as 6.567, and the image only took up part of the page. I went to the Width field and replaced 8.500 with 11, and hit Tab. Whoops! The field reverted to 8.500. The same thing happened if I tried typing 8.5 into the Height field. These fields aren't plain text entries -- they're "spin boxes", with a text entry plus up and down arrows. It turned out that under GIMP 2.8 and earlier, round-off errors sometimes prevent you from setting a spin box's maximum value. I could type 10.999 and it would work fine, but 11 or 11.0 failed. Of course, 10.999 would have been fine -- I don't mind a little margin on a printed map. 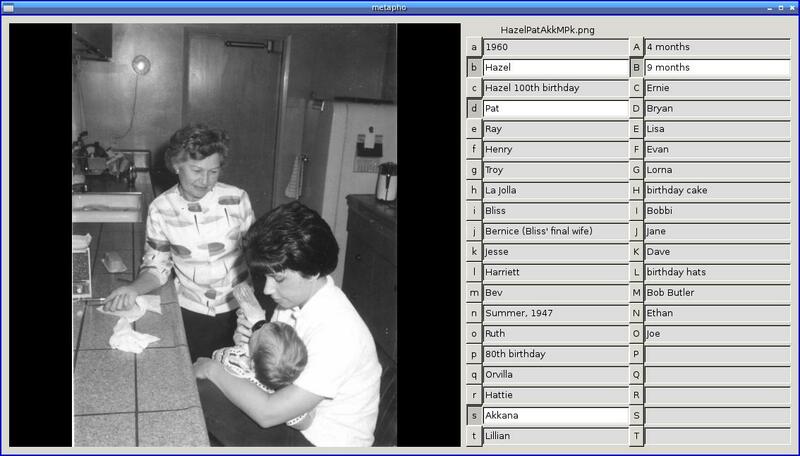 It's also trivial in GIMP to rotate a landscape photo 90 degrees and print it in portrait orientation. But by this point I was into stubborn mode -- by gosh, I wanted a way to fix this! The best workaround, it turns out, is to use the spin box's up-arrow. Holding the mouse down over the up arrow will eventually get to the maximum value. But there's a faster way: right-clicking on the up-arrow goes straight to the maximum value. A nice trick! The problem doesn't exist in GIMP 2.9 -- I reported it as bug 694477, and the awesome GIMP team fixed it very quickly. The spin boxes work beautifully now. (Thanks, Mitch!) But as long as 2.8 is around, or for any other app using spin boxes, I'm glad to know about right-clicking on the spin box arrows. Why should I stop here? Oh, that's why! I love warning signs. 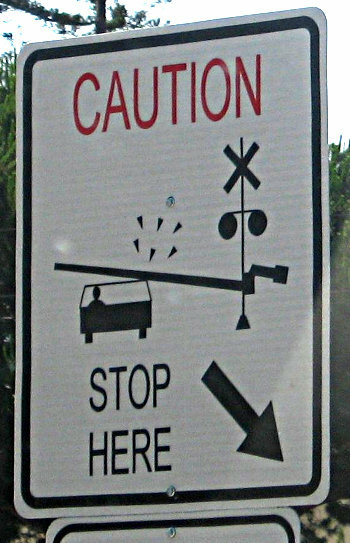 Especially when they have funny pictures on them illustrating the drastic consequences of ignoring the sign. This one is by the railroad tracks in downtown Mountain View. In case you weren't sure what that funny wooden arm was for. I keep seeing references to the massive winter storm that's on the way, but I thought they were talking about New York. And then it started to hail ... and kept it up, long enough that we actually got little lentil-sized hailstones piling up in the yard, looking almost like it snowed. 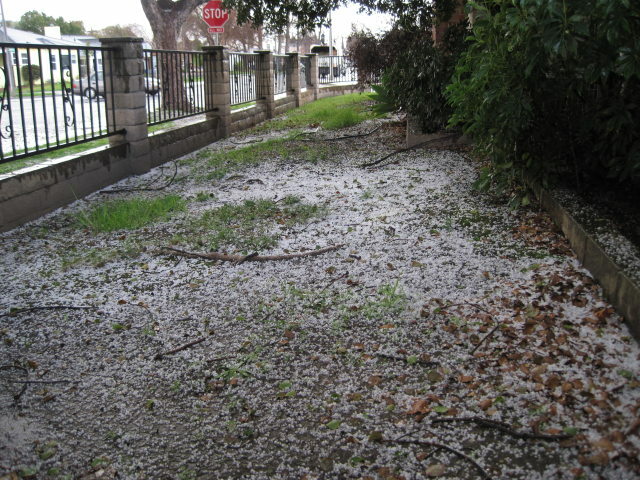 Here are a few photos: Hail in Burbank. 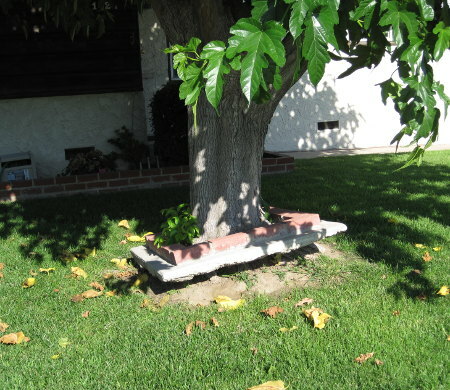 I guess the brick and concrete border was a little too small, and the tree just ignored it and kept growing. Tree: 1. Landscapers: 0. And the neighbors, bless their hearts, didn't try to remove the border -- they left it intact as the tree continued to grow and raised the border higher and higher. It's wonderful -- makes me smile every time I walk past. It reminds me of a great David Wilcox song, Leave It Like It Is.